Lady Gamer for the Month of July: @MissMoonica! I first met Miss Moonica while working with The Game Station, the YouTube network she’s a part of. She’s a Let’s Play gamer who got started thanks to Tobuscus, one of her best friends. 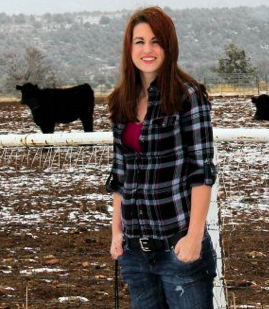 She loves cows (and most other animals) has a super sweet disposition, and is just a lot of fun! 1.) What is your name, what do you do, and where are you from? Miss Moonica, senior at Dixie State University going into Psychology and Communications. I also run my own photography business, work in customer service, and have a lot of hobbies, including making YouTube videos . I am originally from Washington state, but grew up in southern Utah most of my life. 2.) What is your favorite game of all time? What’s your favorite game of right now? I would have to say LittleBigPlanet , it was the first game I played that had me laughing so hard I was crying and catered to my competitive AND creative side. It is fun to play both by yourself and with others, and is so random that you really don’t know what to expect next; perfect for someone like me who gets bored of repetitiveness. My current favorite game is The Binding of Isaac ; I love the design of it and the simplicity, yet it’s always a new game every time you play. Games that keep my interest and are always changing are definitely my favorite. 3.) Why did you decide to start a YouTube channel? My old friend Nathan (Nalif) who I met online had his YouTube channel and it really peaked my interest. I never considered doing it until after awhile when I met him and his best friend Toby Turner (Tobuscus), and they both urged me to try it because girls were really needed in the gaming area of YouTube. They both helped me get started, and I enjoyed it a lot – I got to play games, tell my stupid jokes, ramble on about random things, and people liked me and connected to me because of it! 4.) What has been your favorite moment so far in your YouTube career? I have met my best friends because of YouTube and have traveled a lot to meet them and my fans. One special one has even moved all the way from New Zealand to live practically next door to me :3 All the most important people in my life have resulted because of my YouTube career, and I owe it a lot to it. Connecting with people all over the world who you can help and who can help you in return really changes your life. I never had a clue I could make such an impact on people by just being myself! Being my dorky, awkward self has brought me to people who actually like that about me, and it has made me comfortable in my own skin. 5.) Have you ever been treated differently in the gaming community because you’re a woman? Yes, of course I have. Sometimes I have been treated worse, or judged more harshly, and sometimes I am automatically appreciated just because of the fact that I am in a minority. It works both ways, and I’ve learned to accept every opinion with a grain of salt. I have met some amazing female and male gamers who really have shown me how much they have been through to get to where they are, in spite of ALL judgements, because of something about them. I am proud of being a girl gamer and have made many video supports for both genders to not let any stereotype put them down from doing what they love! 6.) Who is your inspiration? Temple Grandin. She is a VERY intelligent woman who has lived with severe autism her whole life. She ignored the judgements forced down her neck and went to college, got a Ph. D, went into the male-dominated field of cattle ranches, and redesigned the whole system of how they are run and made them significantly more efficient and humane. She is in amazing example of not letting ANY stereotype hold you back and proving that your differences might make ALL the difference in whatever you are passionate about if you don’t give up. 7.) What advice do you have for other gaming girls facing hurdles in their life? Laugh a lot. Sometimes problems don’t just go away – in fact, they rarely do. Find something that makes you happy and stick to it, find people who love what you love and laugh together. Things will get hard, but you can’t give anyone any power by letting them control your life anymore then they already are, so laugh as much as possible and try to do something for somebody else! 8.) What’s next for Miss Moonica? I have a lot of BIG things coming up in my personal life that I can’t share at this time, but I’m pretty excited for how my life is changing and hope that I can continue to be a girl gamer and make some sort of difference in this world just by being myself. It’s a huge blessing to be able to do what you love and love what it does to you and for others. 9.) Anything else you’d like to share/mention? No matter what gender, sexuality, race, or age you are, always chase after what you love and laugh a lot! Your differences that make you ‘stand out’ can really stand out to someone else going through a hard time and inspire them. So never give up, and get back up every time you’ve stumbled and support others who are doing the same! Always have something in your life that is on your mind while you’re drifting off to sleep and the first thing on your mind when you wake up in the morning – have a passion for who you are and what you do! See? I told you she was a sweetheart. Be sure to subscribe to her YouTube Channel, like her Facebook page, and follow her on Twitter!